Alibaba Mail is one of the only email service providers in the industry that supports public cloud services and provides fast, secure, and stable services. Alibaba Mail is one of the only email service providers (ESP) in the industry that supports public cloud services. It provides smart and efficient email management services based on the same security architecture as Tmall and Alipay. 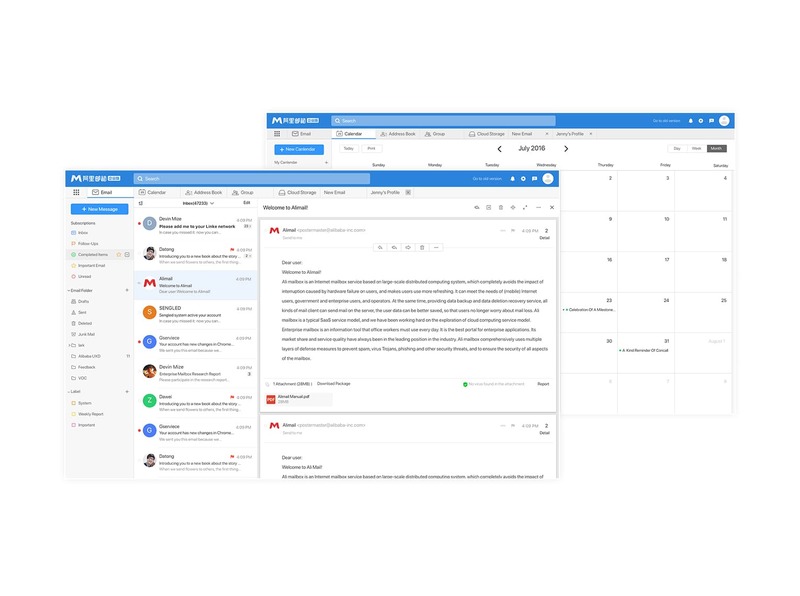 Alibaba Mail integrates features such as email management, online calendars, and contact management, as well as works seamlessly with existing office software applications to achieve better scalability and integration. This service offers enterprise users a brand new collaboration software solution. 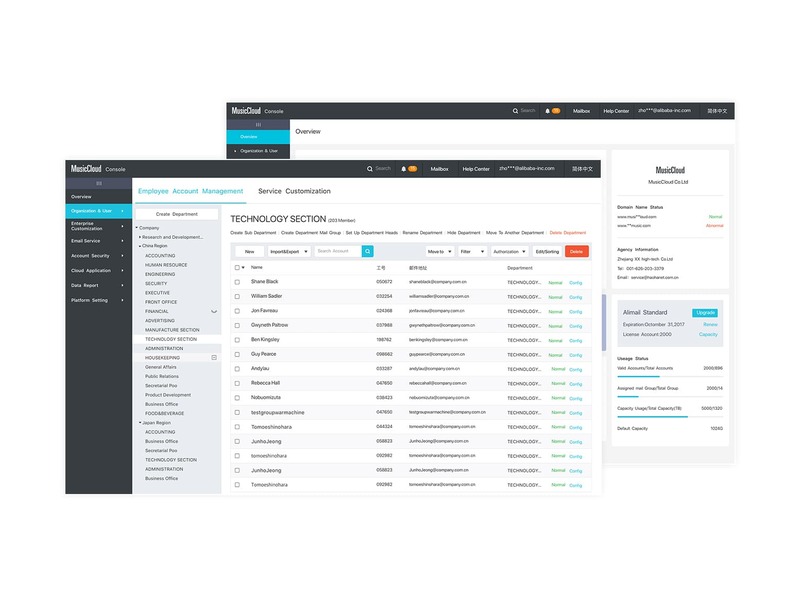 Built on Alibaba Cloud Apsara System, the service provides multiple layers of protection and comprehensive monitoring capability to guarantee your email security. The service offers multiple open APIs and supports Single Sign-On (SSO), user data synchronization across multiple terminals, and Active Directory authentication to meet integration requirements. Calendars and schedules can be synchronized across all terminals. Advanced features such as meeting room management, schedule check are also integrated to enhance collaborative capability. No limits are set on the number of emails in each account. The service overcomes the limits of traditional email services and provides unlimited mailbox storage. Provides mobile applications fully compatible with iOS and Android devices, making office work more efficient. Sends notifications when unusual logon attempts are detected, to ensure the security of your accounts. Offers multiple windows so that you can read and write emails, and modify account settings at the same time to enhance efficiency. Alibaba Mail connects multiple terminals to synchronize calendars and schedules, and offers useful email management features. You can centrally manage work schedules and meeting invitations, and share your calendar with contacts. You can enter the at sign (@) followed by a contact to quickly add the email address of the specified contact to the list of recipients. Mobile applications fully compatible with iOS and Android devices are provided, making office work more efficient. You can add custom labels to classify and manage emails based on habits. You can back up files to the cloud, and share files with contacts. You can use multiple windows to read and write emails, and modify account settings at the same time to enhance efficiency. You will receive notifications when unusual logon attempts are detected. This helps ensure the security of your accounts. You can recall unread emails sent to Alibaba Mail systems. You can easily query logs to find information about user logons, email sending and receiving, and deleted emails. Alibaba Mail provides custom UI designs and allows each organization to bind multiple domains. You can create accounts with different domains or a shared CNAME. The service also allows you to add a delegate to send emails and meeting invitations on your behalf. You can archive emails and easily search emails based on your needs. Each organization can bind multiple domains. This enables you to create accounts with different domains or a shared CNAME. You can easily migrate emails from previous ESPs to Alibaba Mail. You can set the visibility of departments and users for each account. Users may be added to multiple departments. Contact groups are automatically updated when employees join or leave the organization. You can add a delegate to send emails or meeting invitations on your behalf. You can create custom names for meeting rooms and select meeting rooms when you create meeting invitations. You can create administrators with different permissions to improve management efficiency. You can set accounts to monitor other accounts in order to enhance your email security.